As promised, I have been following developments announced by the company and would like to bring you up to date about what they are doing. As reported in this news release from Avedro, in December, during the 5th International Congress of Corneal Cross Linking for Keratoconus held in Leipzig, Germany, the company announced that it had initiated a Keraflex KXL Clinical Trial for treating keratoconus. Editors Note: For those of you unfamiliar with that term, it is a cone-shaped protrusion and/or distortion of the central cornea that typically begins in the teenage years or early 20s and afflicts millions of people around the world. It is a progressive condition, that sometimes can be treated/controlled with hard contact lenses, but also can lead to the need for corneal transplantation for some patients. Initial treatment results from the first group of Keraflex KXL patients, treated by Prof. Omer Faruk Yilmaz, MD of Beyoglu Eye Research and Training Hospital in Istanbul, Turkey, were presented in Leipzig by Prof. John Marshall, PhD, FRCPath, FRCOphthal (Hon), Emeritus Professor of Ophthalmology King's College London; and Dr. Peter Hersh, Professor of Ophthalmology UMDNJ - New Jersey Medical School and Director, Cornea and Laser Eye Institute - CLEI Center for Keratoconus in New Jersey. In their presentations, Drs. Marshall and Hersh reported significant corneal flattening and improved corneal smoothness and regularity in all keratoconus subjects. Dr. Hersh remarked, "Keraflex KXL is a promising new technology to decrease the protruding cone of keratoconus and make the irregular cornea smoother. Our early experience shows improvements in the keratoconic cornea that we have not seen with past technologies. This should help improve vision in patients with keratoconus, a cornea problem that is difficult to correct, as well as improve contact lens wear and vision with glasses. We hope that Keraflex can help avoid cornea transplants in many patients who otherwise might have no other alternative." Dr. Marshall added, "I am extremely excited by Avedro's technology. It has particularly important consequences for the treatment of keratoconus whereby not only can it flatten the cornea, it also has the potential for correcting associated refractive errors without any biomechanical weakening and most unexpectedly, it strengthens the cornea and should prevent or delay any further corneal distortion." Commenting on the presentations, David Muller, PhD, President and CEO of Avedro said, "It was clear that the discerning conference attendees universally welcomed the new data and were equally excited about the promise of the technology for their keratoconus patients who are currently faced with limited refractive treatment options. While Keraflex KXL has been under clinical study for the correction of myopia since the beginning of the year, the data presented in Leipzig is from a separate keratoconus study that began in November. The visually debilitating nature of keratoconus and the lack of refractive correction alternatives for keratoconus patients have prompted the company to accelerate its efforts to make Keraflex KXL commercially available for treating keratoconus patients in Europe as soon as the company receives its CE Mark." More recently, as reported by Ophthalmology Times Europe on February 17, 2010 (and reprinted with permission of the editor of OT Europe), John Marshall and David Muller, along with Margerite McDonald, MD provided an update on their clinical progress. A procedure that uses microwaves to alter corneal refraction may be an alternative to LASIK in myopia patients. A refractive procedure (Keraflex, Avedro) fifteen years in the making uses microwave technology to reshape the cornea. It is currently in initial clinical testing. The technique changes the corneal refraction without removing stromal tissue or creating a flap. The procedure may be promising for patients with low and moderate levels of myopia who are squeamish about undergoing a conventional refractive surgery procedure in which corneal tissue is removed. mid-periphery. “Alteration of the collagen in this region of the cornea applies tensile stress to the central cornea, causing flattening and the reduction or elimination of myopia. The procedure is anticipated to broaden the surgical vision correction market by appealing to people with less severe myopia than those who typically opt for laser vision correction procedures such as LASIK,” according to David Muller, PhD, president and chief executive officer of Avedro. The focused energy used in the procedure, delivered in one pulse of less than 100μs, causes collagen shrinkage and corneal flattening , which does not permanently alter the cornea or require removal of corneal tissue. The procedure is performed under the control of a microprocessor during application of electrodes to the eye. The electrodes, which can vary in thickness and the degree by which they are separated on the corneal surface, are applied to the eye outside of the visual axis. A coolant is delivered in micropulses to control the temperature of the cornea, after which the microwave energy is applied to the cooled corneal area. The collagen in the area treated with microwave energy shrinks, which results in predictable flattening of the central cornea. “By balancing the microwave field intensity and cooling period, the peak temperature generated can be driven to predetermined depths within the corneal stroma, causing changes in the collagen without damage to the corneal epithelium,” said Dr John Marshall, FRCPath, FRCOphth (Hon), the Frost Professor of Ophthalmology and chairman, Department of Ophthalmology, Kings College, St Thomas’ Hospital, London and lead scientific advisor. Histopathologic studies indicate that the induced treatment changes consist of altered collagen fibrils with modifications in the local geometry of the lamellae, Dr Marshall said. These areas of change undergo rapid wound healing in which the matrix assumes a normal appearance and the collagen retains its newly induced curvature. A transient superficial haze apparent immediately after exposure is lost within minutes after treatment. By varying the administered parameters a systematic change in refraction was achieved, he said. Dr Marguerite McDonald, a member of the medical advisory board and clinical associate professor of ophthalmology, Department of Ophthalmology, New York University, New York and adjunct clinical professor of ophthalmology, Tulane University, New Orleans, commented on the procedure. “It is early in the game vis-a-vis the clinical trials which are being conducted outside the United States. Nevertheless, the results are encouraging,” she said. US clinical trials were expected to begin shortly. Author Dr John Marshall can be reached at marshall-eye@kcl.ac.uk and Dr Marguerite McDonald at margueritemcdmd@aol.com. Both Dr Marshall and Dr McDonald have a proprietary interest in this technology. SAN FRANCISCO — The first annual Ophthalmology Innovation Summit (OIS) took place here just prior to the American Academy of Ophthalmology on October 22nd, and by all measures was an enormous success. The stated purpose by the conference organizers, International Business Forum (IBF; Massapequa, NY), and the Conference Co-Chairmen: Emmett Cunningham of Clarus Ventures and Bill Link of Versant Ventures, was to support innovation by facilitating deal-flow and business partnerships between CEOs of young companies, investors, corporate executives, physicians and academic scientists in the field of ophthalmology. The estimated 400 persons who attended were treated to a day that featured excellent presentations from early stage ophthalmic device and pharmaceutical companies and focused, lively panel discussions with savvy participants. The morning sessions were devoted to crisp, 10-minute presentations from 12 device companies and 13 biotech/pharmaceutical companies. All presenting companies are privately-owned and mostly venture capital-backed. One presenting company, Swiss-based ESBATech, announced that the industry’s largest player, Alcon, had recently proposed an acquisition for $150 million in cash, plus contingent payments of up to $439 million. Alcon’s interest in the company stems from its proprietary antibody fragment technology, which is particularly suited to treat a variety of ocular diseases. The session devoted to devices featured companies addressing both the anterior and posterior chamber of the eye. The former included the refractive surgery companies Acufocus, ReVision Optics, PowerVision and NuLens, and cataract surgery companies LenSx Lasers and Wavetec, while the latter group included companies addressing the posterior chamber, treating diabetic retinopathy and age-related macular degeneration (AMD). The presenting companies from that segment were VisionCare Ophthalmic Technologies, OptiMedica, NeoVista, Oraya Therapeutics and SecondSight Medical. The refractive surgery market has been an attractive area for venture capital investment in recent years, as evidenced by the acquisition in early 2008 of Eyeonics by Bausch & Lomb for $300 million plus a significant earnout and a more recent deal that saw the Abbott Medical Optics division of Abbott Laboratories acquire Visiogen for more than $400 million. Both these companies had raised a substantial amount of venture capital and these investors have been handsomely rewarded. Both Acufocus and ReVision Optics (RVO) are addressing the huge potential market for treating the pre-cataract patient who has presbyopia. Each company has its own unique and proprietary design for an intracorneal inlay, which are very tiny implanted devices that are placed within the eye, just in front of the cornea. In his talk, ReVision CEO Randy Alexander said that there are 90 million people in the “wealthy nations” that have lost their reading ability as they have aged but yet have excellent distance vision. He sized this potential market of 90 million patients at $75 billion. These patients, who Alexander referred to as “plano presbyopes,” are typically highly motivated to get rid of their reading glasses and enjoy good near field reading. RVO hopes to begin U.S. trials with its PresbyLens product within the next couple of months, launch its pivotal trial in mid-2010 and begin to sell in the U.S. market in 2014. The Acufocus product, which is called the Kamra, is a doughnut-shaped, opaque monofocal device that has thousands of tiny holes designed to allow nutrients to pass through to the cornea. Its efficacy and safety have been well-established, with more than 800 patients implanted in seven clinical trials around the world. Its most recent clinical data showed that most patients are able to read the small print in the newspaper, while retaining excellent distance vision. Acufocus has launched its product in Japan and Singapore and expects to generate more than $5 million in revenue in 2009. In the critical U.S. market, the company is in the midst of a pivotal trial, hoping to complete enrollment late this year and then begin to sell in domestically in 2012. Whereas Acufocus and RVO plan to address the population that has lost its accommodative or reading ability, both PowerVision and NuLens are developing accommodative intraocular lenses (IOLs) that are primarily intended for older individuals who have a cataract but who want to maintain their reading ability without glasses. This is the same market that is currently being addressed by Eyeonics and Visiogen, but with IOLs that may fall short of satisfying the needs of all patients. According to PowerVision CEO Barry Cheskin, the company’s product, tradenamed FluidVision, utilizes natural muscular accommodating forces in the eye to move fluids in the IOL. This results in shape change, similar to what occurs in the natural lens and creates a wide accommodative range, which Cheskin estimated at five to10 diopters. NuLens CEO Ori Gal, whose company is based just outside Tel Aviv, Israel, stated that his company’s IOL is based on the known physics phenomena of material displacement. Two separate elements in its IOL are combined to single functional unit inside the eye, with each element having different flexible properties to enable its passage through a small corneal incision. Both companies are in the early stages of their human clinical trials, with potential entry into the domestic market in the 2013 to 2014 range. Assuming that they can truly provide a correction of five diopters or more, both companies could be very successful. Ron Kurtz, MD, a founder and the CEO of LenSx Lasers, discussed the company’s highly innovative, image guided femtosecond laser for cataract removal. Stating that “cataract surgery technology has been static for the past 20 years with heavy reliance on individual surgeon skill,” Kurtz described the revolutionary concept of an “all laser” cataract removal system. He believes this approach will be extremely precise, safer and most likely would provide superior outcomes for the patient. Over 250 clinical cases have been performed thus far, with excellent results and the company currently intends to commercialize in the U.S. and in Europe in late-2010. Two other competitors are also poised to enter this market in approximately the same time frame, including OptiMedica, who presented here. Very similar to LenSx, Optimedica employs a femtosecond laser to precisely remove the cataract prior to the IOL implant. Although CEO Mark Forchette did not provide an estimate of how many cases have been done, it seems apparent from the timing of their first-in-man procedure that they trail LenSx in terms of the number of patients treated. Similarly, another venture-backed company LensAR, is planning to enter this market. Preliminary results on 59 eyes were presented at the AAO by Louis Nichamin, MD, who noted that this approach provides a “more accurate . . . repeatable . . . and more regular (capsular) shape” than does manual operation. Another fascinating device technology that is rapidly moving through the clinical stage to commercialization is the use of radiation to treat later stage or wet AMD. The two key participants in this space are both Northern California-based companies -- NeoVista and Oraya Therapeutics. The basic concept is that ionizing radiation has strong inhibitory effects, namely that it is anti-angiogenic, anti-inflammatory and anti-fibrotic. Despite the perception that radiation can be dangerous, thus far the clinical studies, with more than three years of follow-up, have shown that it is indeed very safe. Moreover, according to some preliminary clinical trial results, it also is effective in decreasing the need for very costly anti-VEGF agents like Lucentis and, importantly, can also improve visual acuity. Each company uses a very different approach to achieve the same end results. NeoVista’s approach is called epimacular brachytherapy, and it incorporates a vitrectomy and the brief administration of a beta radiation source, strontium-90, to the macula. Oraya’s IRay system features a non-invasive, low-voltage, stereotactic radiosurgical device designed specifically for office-based ophthalmic use. IRay delivers a precise dose of radiation noninvasively through the sclera to the macula using a robotic positioning system, a proprietary localizing algorithm and a novel methodology for eye stabilization. At a "Late-Breaking Development” session at the AAO meeting, the results of NeoVista’s 50 patient MERITAGE 1 trial were presented by Pravin Dugel, MD, a managing partner of Retinal Consultants of Arizona. The study met both endpoints, as the number of injections six months after radiation decreased from an average of four per patient to two, while 63% of the patients gained additional visual acuity, with half the patients gaining five letters or one line on the reading chart . Dugel also noted that NeoVista's pivotal trial, dubbed CABERNET, recently completed its full enrollment of 450 patients. These results, which should support a PMA filing, are expected to be released in late-2010. Oraya's feasibility trial has been conducted in Mexico and Dr. Peter Kaiser of the Cleveland Clinic reported on the results of the first 28 patients. Like NeoVista, its clinical data is showing that it both improves visual acuity and reduces the therapeutic burden with a reduction in the number of injections. Oraya hopes to initiate its pivotal trial, which is unnamed as yet, in the first half of 2010. Oraya's new CEO Jim Taylor, joked at the meeting that their trial would be called by the acronym LITEBEER (fully-named Low Intensity Therapeutic Energy for prevention of Blindness through Employment of Externally sourced Radiation), a spoof on the wine-related clinical trial names used by NeoVista. This meeting also featured a diverse group of pharmaceutical/biotechnology companies. Despite the large and well-developed global market for ophthalmic pharmaceuticals, estimated at $10-11 billion annually, several presenters noted that there still remain market opportunities with unmet needs. Glaucoma accounts for the largest share of global ophthalmic pharmaceutical market, garnering about 40% of the total. It is considered to be the second leading cause of blindness in the U.S. and the leading cause of blindness amongst black Americans. The incidence of glaucoma is expected to increase significantly over the next ten years as the population ages. A family of drugs called rho-kinase (ROCK) inhibitors indeed do appear to restore natural outflow to the trabecular meshwork, thereby lowering IOP. Aerie’s lead compound AR-12286 has shown in an 88 patient trial that it is safe and can successfully reduce IOP. The company is scheduled to start a larger study in early-2010 and hopes to release study results in time for the 2010 annual meeting of the Association for Research in Vision and Ophthalmology (ARVO). Perhaps more importantly, through its screening of ROCK inhibitor pro-drugs, Aerie has discovered a compound with a unique in vivo efficacy profile. Its dual mechanism of action is responsible for exceptional activity. The first drug in this new proprietary class, AR-13165, has shown great promise in animal trials and will begin human trials shortly. The article further quoted a physician who is co-developer of such a device as saying that “any eye disease that needs chronic treatment could benefit.” Aerie’s first implant will employ latanoprost, the chemical used in the biggest selling glaucoma drug (Xalatan) today. A latanoprost implant IND will be filed in late 2010. Despite the tremendous success (global sales in 2009 estimated at over $1 billion) of the anti-VEGF agents, there remains a significant opportunity to improve the treatment of AMD. This disease is the leading cause of irreversible visual loss in elderly persons in the Western world. Several presenting companies discussed their AMD programs at the Summit. Samir Patel, CEO of Ophthotech, discussed his company’s pipeline of compounds for treating wet and dry AMD, noting that while the anti-VEGF drugs are clearly providing significant patient benefit (in the form of better visual acuity) they do not induce neovascular (NV) regression. The compound PDGF has been found to regulate vascular maturity and in a feasibility trial, the combination of the company’s anti-PDGF agent with Lucentis has demonstrated a good safety profile and enhanced visual acuity. These benefits have occurred as a result of NV regression. A larger Phase IIb trial is expected to commence soon. Sirion Therapeutics has several drugs in various stages of development, including fenretinide for treating geographic atrophy (GA). A devastating form of dry AMD, GA is not as widely known as the later form of AMD (neovascularization), despite the fact that its prevalence is nearly as large. Moreover, there are currently no available treatments for GA, with patients often experiencing blindness. Initial trials with an oral form of fenretinide are showing that it reduces the loss of photoreceptors and these findings have spurred the FDA to grant “fast track” status to this drug. 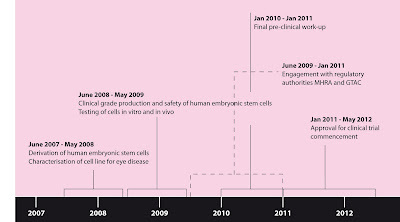 Sirion also has two other AMD compounds in the pre-clinical stage and a glaucoma agent that is in Phase 1/11. Neurotech CEO Ted Danse described his company’s encapsulated cell technology (ECT) as “transformational,” with the possibility of making a major impact on how retina diseases will be treated in the future. ECT enables controlled, long-term delivery of a variety of biologics directly to the back of the eye. The procedure involves a 20 minute out-patient intravitreal implant. The company’s first foray into ophthalmology involves two compounds for treating AMD, NT-501 and NT-503. In a Phase ll study in the U.S. with 51 patients, the agent NT-501 for dry AMD/GA showed a significant dose-related benefit in stemming the loss of vision over a 12 month period. The company’s pivotal program dry AMD/GA indication has been designed and accepted by FDA (two 300 patient studies with a12-month endpoint and12-month follow-up). This pivotal clinical will be initiated with new venture funding or a corporate partnership. Neurotech’s wet AMD program is using a VEGF antagonist NT-503, which is also in human clinicals in the U.S. Its potential advantages are a controlled, continuous delivery of the drug, eliminating repeat injections, which are a major burden for patients and retinal specialists alike. LuxBio Sciences is developing a first-in-class drug for the treatment of uveitis, which is a group of ophthalmic diseases characterized by inflammation in different anatomic locations of the eye. The company indicated in its presentation that about one-third of all cases require systemic treatment or implants. In general, topical treatment is not effective. The treatment option for this disease, which can lead to blindness if not controlled, are corticosteroids, which have well-documented and severe adverse effects from chronic use. According to the company’s CEO Ulrich Grau, LuxBio’s drug (trade-named Luveniq) is the first drug to demonstrate efficacy for the treatment of active uveitis. The results from its pivotal trial, with dose ranging have shown outstanding safety and efficacy, with a 50% reduction in inflammation from baseline. This was much higher than the placebo level. In addition, this drug has a benign safety profile that supports its use in the treatment of chronic uveitis. With these stellar results, LuxBio is targeting a year-end 2009 New Drug Application, hoping for an FDA approval and product launch in mid- 2010. The company believes that this drug can generate annual revenue in the $500 million range. The EuroTimes article referenced above cited LuxBio’s device LX201, a silicone matrix episcleral implant that is designed to deliver cyclosporine A to the eye’s surface for a full year. It noted that in March 2009, LuxBio Sciences completed enrollment in a phase III trial to prevent corneal transplant rejection. Further, the article indicated that the company is developing bio-erodible polymer implants for potential use in severe dry eye, macular degeneration and diabetic macular edema. focused on building a first-rate management team and then identifying two-to-four “high value assets” to treat major ophthalmic diseases. His company will concentrate its focus on the large commercial markets with unmet needs, seeking to identify solid leads and opportunities that can become successful new products. Following product identification, the company will perform extensive due diligence to evaluate whether this product has several attributes that make it a sufficiently attractive opportunity to continue forward. Four compounds have already been identified for further serious evaluation, with the goal to finalize the selection process soon, complete the licensing agreements and raise money to fund their development. iCo founder Andrew Rae discussed his company’s philosophy, saying it aims to “re-define existing drug candidates or generics for new or expanded use indications.” Its current pipeline features three drugs, one for diabetic macular edema, another for wet AMD and a third for fungal infections. In the case of the first two, iCo owns the global rights to the drug, in the case of the anti-fungal, it owns exclusive worldwide rights for an oral formulation. The potential of each drug is significant; for example current sales of the non-oral form of the antifungal drug generates annual sales in the $300 million area. There were several interesting and highly informative panel discussions during the all-day conference. Also, the meeting included a lunchtime interview with two of the industry’s most successful, entrepreneurial and well known executives, Andy Corley and David Guyer, MD. Corley was formerly the CEO of the IOL company Eyeonics and is currently the president of the surgical division of Bausch & Lomb while Guyer was former CEO and founder of Eyetech Pharmaceuticals, which developed and marketed a drug (Macugen) for wet AMD. He is now a partner in the venture capital firm SV Life Sciences. Another panel, titled “What Ophthalmic Device Companies Are Looking For,” featured Corley and veteran senior vice-presidents, Bill Barton, from Alcon and Jim Mazzo from Abbott Medical Optics. Both executives agreed that new product flow in large companies should arise from a balanced contribution of internal development and strategic alliances, partnerships and acquisitions. Mazzo asserted that “true innovation will always rest in the small companies,” which Barton readily agreed with. Responding to the question “what characteristics of private companies excite you or turn you off,” from the moderator and conference co-chair Bill Link, Corley responded by saying “an undefined market really troubles me.” Mazzo cited three key positive attributes: (1) A solid track record of success by management; (2) Good international marketing potential; (3) Is the procedure applicable to the “average Joe” ophthalmic surgeon? Barton noted that he looks for a significant unmet need or a solution to a clinical problem, integrity and honesty in the management team and “fair value” for both sides in the deal. He also said that ophthalmology is a “huge small business” with many niche opportunities available. The meeting concluded with all enthusiastic about the prospect of a new forum for those with an interest in ophthalmic innovation and entrepreneurship. Hopes were high for an annual meeting, with planning to begin for the next AAO meeting, with the next Ophthalmology Innovation Summit tentatively scheduled for Thursday, October 14th, 2010. Last October 27th, I first reported on the disturbing news about particulate matter causing IOP spikes following Avastin injections, as reported during the 2009 AAO Meeting by Dr. Malik Kahook. Well, Dr. Kahook expanded on his remarks at the Royal Hawaiian meeting in January (Hawaiian Eye 2010), which first appeared on the OSN Supersite on January 21st. The editors of OSN Supersite have now updated his remarks and re-published them today. "Avastin is not formulated for sitting in a plastic syringe for an extended period of time. It is also not formulated for sitting in a plastic syringe that has a rubber stop in it. Exposure to light can also change the properties of stored bevacizumab. So all of these things are influencing what we are seeing," Malik Y. Kahook, MD, said at Hawaiian Eye 2010. In 2007, the first reported case of increased IOP due to anti-VEGF treatment was published, he said. Since then, there have been at least 56 published reports showing IOP spikes of up to 40 mm Hg to 50 mm Hg in age-related macular degeneration patients treated with Avastin (bevacizumab, Genentech) and/or Lucentis (ranibizumab, Genentech). Dr. Kahook and colleagues looked at a variety of possible explanations, such as inflammation, toxicity and concentration, but none explained the complication. While the concentration of bevacizumab in syringes decreased after storage, Dr. Kahook used micro-flow imaging to show that the particles per million in the bevacizumab actually increased. In samples obtained from a single compounding pharmacy, the researchers found there was 10 times more large particulate matter. The exact nature of these particles is still under investigation, he said. "I want to make it clear that these medications have been extremely beneficial for diseases like wet age-related macular degeneration, as well as neovascular glaucoma and that the anti-VEGF agents themselves appear to be safe and well-tolerated," Dr. Kahook said. "Despite the excellent safety profile we have seen some complications and in particular the increase in IOP in patients after receiving single or multiple injections of either Avastin or Lucentis. "While IOP spikes have been seen with Lucentis, it is much more frequent in patients receiving Avastin injections, and we have not seen a large number of particulate matter in the syringes of Lucentis that we have studied. "It does appear that the Avastin repackaging process in some cases is not ideal and can be improved upon," he said. Dr. Kahook suggested ophthalmologists should learn more about their source of repackaged bevacizumab, ask for syringes stored for less than 2 weeks and keep syringes in the refrigerator until needed. He also suggested not shaking or tapping the syringes and possibly buying one's own vial rather than buying the repackaged syringes. Editor's note: This is an updated version of an article that appeared on the OSN SuperSite on Jan. 21, 2010. As you may know, the London Project To Cure Blindness is a 5 year research project based at University College London that launched in June 2007. The main aim of the project is to develop a surgical cell therapy for Age-related Macular Degeneration (AMD) by 2012, whereby the diseased retinal support cells, the retinal pigment epithelium cells (RPE), at the back of the eye are replaced by healthy RPE cells that have been derived from human embryonic stem cells. RPE cells form a monolayer behind the photoreceptors - the "seeing" part of the eye - and support their function by providing nutrients and removing debris. The degeneration of the RPE cell layer is the underlying cause of AMD. This therapy is primarily aimed at dry-AMD which accounts for approximately 90% of AMD cases and is currently untreatable. However, the therapy would be suitable for both dry and wet AMD. We are pleased to inform you that we have now moved into the stage of the project where we are ready to initiate the safety studies necessary prior to clinical trials, and are still on track for the initial human clinical trials to commence in, we hope, the first quarter of 2011. Nevertheless, it is important to stress that the exact launch date of the trials is very much in the hands of the regulatory bodies here in the UK, provided that they are fully satisfied with the safety study data that we are scheduled to submit to them at the end of 2010. Considering that these will be the first human embryonic stem cell trials in man in the UK, the project really will be breaking new ground. Recent developments have revealed that there will be strict criteria for patient inclusion in the initial trials and that they will not be open to volunteers. There is no list on which patients can record their interest in trials. Once the initial trials are approved by the regulatory bodies they will take place at Moorfields Eye Hospital, where patients will be organized. Further information regarding the up-scaling of the trials and the patient criteria will likely become available after this point in time. As I learn more, I will continue to update the team’s progress.